I sit on my heels next to a high-burning fire and rock back and forth, toe to heel, toward the fire and away from it. Leaning in, I cup the palms of my hands to its heat. Tongues of flame lick blackened lips of wood as if they want to tell my fortune with hot, strange words. In Botswana, this close to the equator, there are twelve hours of daylight and twelve hours of darkness. The earth rolls into night at 1,000 miles a minute – thirty minutes from sundown to dark. No long sunsets technicolored by particles of pollution, no lingering light due to the earth’s tilt, no instant barrage of street lamps. My night is lit only by flame and stars. 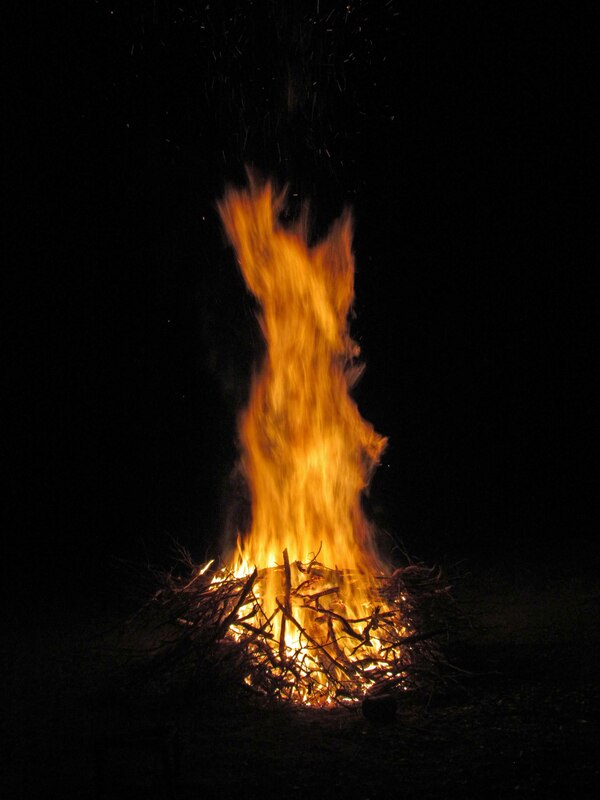 The fire spits an ember into the sand near the toes of my boots where it flares and dies. Above my head a brilliant swath of the Milky Way spanned a vault of sky already crowded with stars. Stars wheel toward dawn, the second hand on a clock face, the only clock that measures eons of time. The people of the Kalahari call the Milky Way “The Backbone of the Night.” They believe it keeps the sky from crashing down on their heads. If I squint hard enough, long enough, the Milky Way knits itself into what might look like pieces of solid bone. Each time I look up it births even more new stars. Most of our Old Stories must have originated like this, at night, around a hand-warming fire. I walk down the path to my tent. Soft night shadows loom around the circle of my flashlight. At the tent’s threshold, I switch it off. I trace the outlines of gods in the constellations overhead. I see Orion doing a slow cartwheel, his left hand already touching the horizon. Leo naps on his back, the way most lions sleep. Scorpio thrusts one claw into the leaves of a fan palm. Buried deep in the Milky Way, a jewel box of stars contains the tiny, tilted Southern Cross. Moonlight rains through mesh openings of the tent’s windows, spatters my blanket with shifting, delicate squares. Sleep comes quickly, like an African nightfall. My dreams fill with elephants as the backbone of the night arches over me and holds up the entire sky. Thank you so much, Gill! I’m gonna steal that line! This is beautiful. “The beginning and end are up there somewhere.” I love this sentence…how the writer seems to be at peace, in the middle. Thank you, Anna. I really value your opinions on writing, so if you see anything that doesn’t ring true, please let me know.